This afternoon, my sister and I were given an architectural tour in Mexico City by Fabianita and J.P. Banks from Antidomingo. The tour focused on architect Teodoro González de León. His architecture is characterized for its monumentality. Most of his commissioned projects are public buildings, cultural centers and large business complexes. His staple architectural elements are wide angular murals, ample plazas, and ‘cemento martelinado’. The latter is a technique that involves repeated stomping on wall and floor surfaces made from a combination of cement, pebbled-gravel and sand. The Museo Tamayo Arte Contemporáneo, where I began working a couple of weeks ago, was designed in this style by Abraham Zabludovsky with González de León. These textured cement facades—which some come in gray, as in the museum; sandy pink as in their Auditorio Nacional, or white, as in the new Reforma 222—are without doubt a signature of these two mexican architects. Zabludovsky and González de León collaborated in a number of public buildings during the 1970s and 80s, including designing the offices of Delegación Cuauhtémoc and INFONAVIT, a Banamex franchise in Mexico City’s historic center, and a large building complex including the Universidad Pedagógica Nacional, Colegio de México, and the headquarters of the Fondo de Cultura Económica. (The last of these was designed and built in the 1990s, and by González de León alone.) Their most-known collaboration, however, is the 1992 refurbishing of the Auditorio Nacional, located in Paseo de la Reforma, a historic avenue commissioned by Maximilian I, emperor in Mexico from 1863 to 1867. Also along that avenue is Reforma 222, a new high-structure designed by González de León including a hotel tower, shopping mall and business center. We didn’t make it today to González de León’s recently opened Museo Universitario de Arte Contemporáneo at UNAM, since I had paid a visit last weekend, nor to the commercial center El Conjunto Arcos Bosque, known as “El Pantalon,” which he designed with J. Francisco Serrano. But we did visit the Centro Nacional de las Artes, consisting of a complex of ten buildings designed by different architects of renown including Ricardo Legorreta, Enrique Norten and Luis Vicente Flores. In this monumental building complex devoted to the study and practice of fine arts, theatre, cinema, dance and music is González de León’s Conservatorio Nacional de Musica. 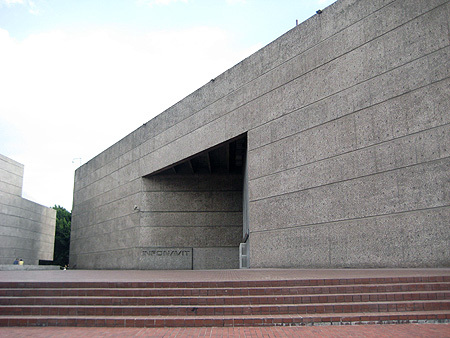 The site-visits to Teodoro González de León’s buildings in Mexico City comprise one of several tours on modern and contemporary architects in Mexico that I’m doing this summer. Images of today’s tour can be found in Flickr.